A reported surge of extrajudicial killings victimizing children has exacerbated concerns about the campaign. Public anger is rising in the Philippines over the reported surge of extrajudicial killings that have victimized several children and teenagers. During his second State of the Nation Address (SONA) in July, President Rodrigo Duterte signaled the intensification of the “war on drugs,” which he defended as necessary and crucial to fight rampant criminality and corruption across the country. Duterte’s “war on drugs” has been controversial from the very beginning, since it allegedly involved the extrajudicial killing of suspected drug peddlers and users. The anti-drug operation (Oplan Tokhang) has already killed 7,000 persons, but some human rights groups think that the number of drug-related killings could reach 12,000 if we are going to include the unreported cases. Police officials have consistently claimed that rival drug gangs are behind the extrajudicial killings. They also insisted that state forces are only forced to retaliate because suspects have been violently resisting arrests. Aside from making Tokhang the top priority of his government, Duterte is accused of abetting impunity by vowing to protect cops who kill drug suspects. Early in 2017, the killing of a Korean businessman inside a police camp and the backlash it generated forced the government to suspend Tokhang. But in a matter of weeks, the killings resumed in poor urban communities. Duterte’s SONA speech worried many because it was believed that it could lead to more drug-related deaths instead of addressing the demand of human rights groups and the international community to rethink the methods of Tokhang. And as if on cue, police intensified Tokhang operations and produced a record number of killings in a matter of days. A Tokhang operation on a single night killed 32 drug suspects in Bulacan province and 26 in the capital Manila. Duterte praised this operation. “Thirty-two were killed in a massive raid in Bulacan. That is good. If we could kill 32 every day, then maybe we could reduce what ails this country,” he said in a media interview. But the media also reported that a 17-year-old student was killed by the police during a Tokhang-related arrest in Caloocan, a northern suburb of Manila. Later, CCTV footage of the crime scene showed a boy being dragged by the police which convinced many that the Tokhang operation killed another innocent person. The police were loudly condemned for this atrocity. Duterte, too, was blamed for inciting police abuse. The media reminded the public that this is not the first time that a minor was killed in a Tokhang operation. In fact, 54 children have been killed already since 2016. The Senate conducted a probe of the incident; the powerful Catholic Church issued a strong statement against drug-related killings; the opposition pinned the blame on Duterte’s aggressive brand of leadership; and a funeral protest was held to dramatize the clamor for justice amid the spate of extrajudicial killings. A member of Duterte’s Cabinet complained that the incident is being blown out of proportion. The police defended itself by releasing a report which tagged the teenager as a suspected drug courier. But many continue to express outrage over the killing of a student. Sensing a shift in public opinion about Tokhang, Duterte modified his stance by vowing to punish rogue cops. Public anger has yet to subside when a similar Tokhang case was reported by the media. This was followed by more news reports highlighting the tortured bodies of teenagers who allegedly died while under police custody. Duterte seemed baffled by the reports and accused sinister forces of trying to sabotage the government’s anti-drug campaign. But Duterte’s problem is his refusal to acknowledge that the main problem is the framework of Tokhang itself. The obsession for quick results to end the drug menace, plus the alleged bounty for every dead drug operator, probably fueled the brutal killings in poor communities. Compounding Duterte’s woes is the extrajudicial killing of a Lumad (indigenous people) teenager in a militarized community in Mindanao, where Martial Law remains in effect. The issue exposed the bloody legacy of Duterte’s decision to launch an “all-out war” against communist rebels instead of pursuing peace talks. Some believe the issue of human rights abuses involving children is aimed at distracting the attention of the public after a Senate probe implicated Duterte’s son in the shipment of illegal drugs in the country’s ports. It may be true. But it does not invalidate the urgent demands to rethink Tokhang, to probe and punish police abuse, and to make Duterte accountable for the worsening human rights violations that are taking place across the country. Recent weeks have seen another rise in violence that has placed greater scrutiny on the Philippine president and his methods. 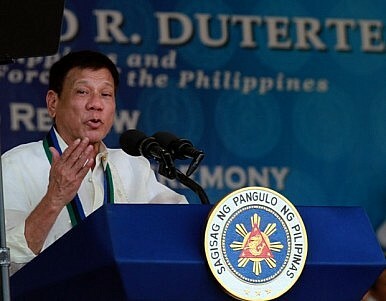 Duterte’s War on Drugs Can’t Escape International LawIs There Really a New Duterte Coup Plot in the Philippines?What Does Duterte’s Signing of the Bangsamoro Law Mean?Duterte’s Anti-Women Behavior Sparks the Philippines’ Own #MeToo MomentDoes Duterte’s War on the International Criminal Court Really Matter?